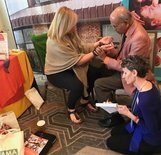 We had the pleasure of attending the 2017 National Ayurvedic Medical Association (NAMA) Conference in Oak Brook, IL which is the association's most exciting event of the year. This conference provides professional development, time to connect with the Ayurveda community, and opportunities to celebrate the important work NAMA has accomplished. There was an incredible lineup of speakers; one of which was award-winning, board-certified neurologist best known for her innovative and integrative approach to treating headache pain - Trupti Gokani, MD. She spoke of her journey into hollistic treatments of headache pain and how she eventually opened her practice: Zira Mind and Body Center. Dr. Gokani has also appeared on the Dr. Oz show numerous times. It was a true honor to then listen to Dr. Vasant Lad, MAS. Dr. Lad is a world-renowned ayurvedic physician from India. He is the founder of the Ayurvedic Institute in Albuquerque, New Mexico, and the author of numerous books. At the conference, he was also offering pulse readings (pictured to the right) in which he tells you your dosha. Pictured below are images from our booth at the conference where we were talking about our mission to integrate Ayurvedic practices into home, work and travel for consumers. It was great to connect with the fellow Ayurveda community at this year's conference, we look forward to next year's!